Welcome to Day 5 where you'll learn more about Banjo's poetry and influences. You may be surprised! 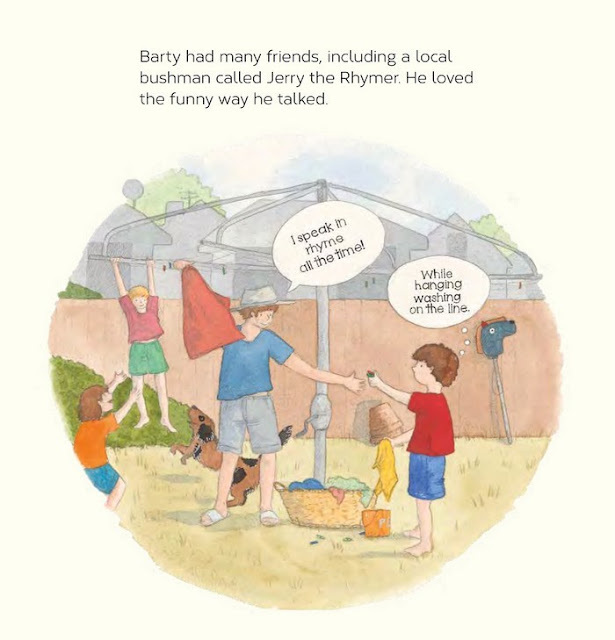 One of Banjo's (or 'Barty' as he was called by his family) earliest poetic influences was a man named Jerry the Rhymer. Christina has depicted him (as the young lad's father) above. Jerry was a 'shepherd' or bushman who lived near the Paterson property, Buckinbah Station, near Orange, New South Wales. He had a habit of speaking in rhyming slang and young Barty found him fascinating. He loved spending time with him and his son Jim, who was a teenager at the time. Another major influence was Banjo's maternal grandmother Emily Mary Barton. She lived in Sydney at a house in Gladesville (you can see current images here - it is now a restaurant). Barty went to live with her when he turned 10, so he could attend Sydney Grammar School. As an accomplished poet (she began writing in the 1840s; you can read more about her here), Emily encouraged her grandson to read and write verse. Naturally, much of Banjo's work was inspired by the bush, horses and justice; some of Banjo's early poems were influenced by his work as a solicitor. Clancy of the Overflow is said to have been inspired by a lawyer's letter he'd had to write to a man who hadn't paid his debts. When Banjo first began submitting his work to newspapers and magazines in 1885, he quickly developed a relationship with The Bulletin (this is where he adopted the pseudonym, The Banjo). Here, many of his works were published, and it's also where he and Henry Lawson embarked on their good-natured rhyming 'battle'. One of his most famous poems was set to music (arranged by Christina Macpherson, who adapted it from an old Scottish song 'Craigeelee'). It was, of course, Waltzing Matilda, another poem inspired by real life events. 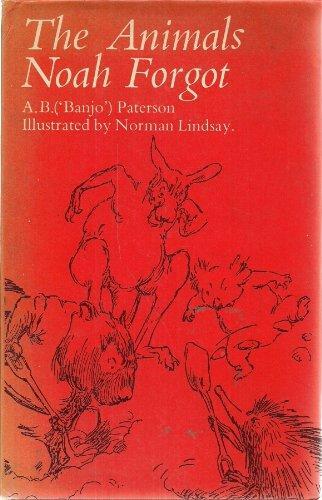 During his life, Banjo was compared to Rudyard Kipling in terms of his poetic talent, and by the end of his life, he had become one of Australia's most enduring poets--a legacy that remains today. Many of Banjo's books are still in print, and he even wrote a book for kids--The Animals Noah Forgot (1933, illustrated by celebrated artist Norman Lindsay)--a copy of which I managed to find online. Alas, it's not a first edition, but a still-perfectly-vintage 1970 edition. You can view a complete list of Banjo's poems at the Australian Poetry Library. Do note that some of these poems have altered over time, and there are several versions of the most famous. Indeed, Waltzing Matilda has changed over time, and This is Banjo Paterson features the original text, not that which is sung today. Stay tuned for Day 6, where we reveal fabulous Banjo resources for teachers and librarians. Click here for the full list of launch posts.